(Steve Griffin | Tribune file photo) Michelle McOmber is chief executive officer of the Utah Medical Association. Michelle McOmber, CEO of the Utah Medical Association, talks in favor of HB130 during the Senate Health and Human Services Standing Committee meeting at the State Capitol in Salt Lake City Thursday February 16, 2017. HB130 would enact provisions related to research of cannabis and cannabinoid products. 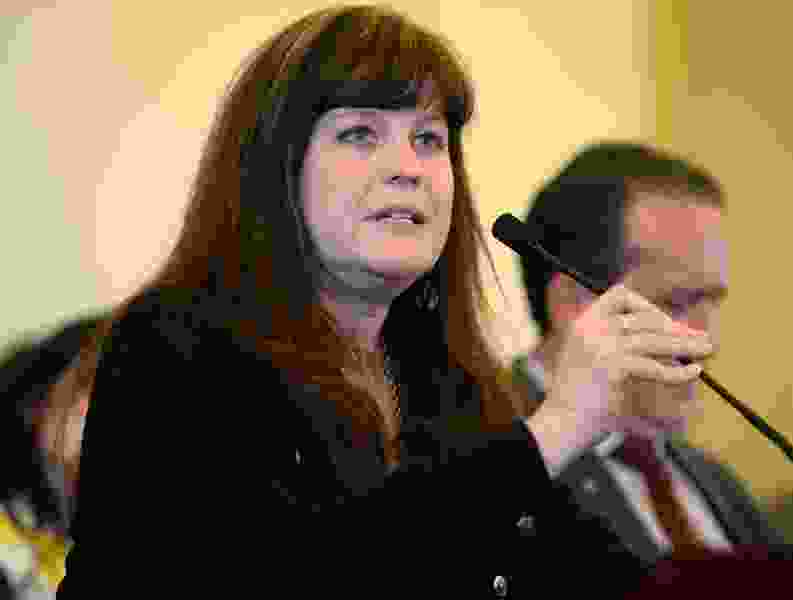 The Utah Medical Association is accusing leaders of a petition to legalize medical marijuana of misleading voters into supporting the measure and urged residents who signed on to call their county clerks and have their names removed. The UMA statement comes as opponents to the initiative line up, and it follows years of opposition from the group that represents and advocates on behalf of Utah’s doctors. “This initiative is not about medicine,” the group said in a statement released late Friday. The UMA concerns of legalized medical use leading to recreational marijuana echoed that expressed late last week by Gov. Gary Herbert. In response, the Libertas Institute, which supports the initiative, said the UMA wasn’t speaking for all doctors in Utah. The UMA position reflected some physicians’ uneasiness dealing with a product that’s federally illegal but allowed in 29 other states medicinally and eight for widespread adult use. Rep. Ed Redd, a Republican and Logan physician, said he wasn’t surprised by the UMA statement. There are many variables with cannabis that could make doctors wary of recommending the plant or cannabis products to their patients, he said. “Are we willing to go down the pathway of recommending sort of an herbal remedy with certain benefits and risks to the patients?” Redd said. “Especially if we’re not sure what we’re recommending interacts” with other medications. Redd said lawmakers took the right step in passing bills that would allow for a state-run dispensary to authorize marijuana only to patients who are expected to die within six months. But he said he was concerned some patients suffering a debilitating illness that may benefit from marijuana couldn’t under the new law, HB195. The initiative, if passed this November, would require the state to begin issuing medical marijuana cards to adults or the parents or legal guardians of children whose doctors recommend marijuana by March 1, 2020. It would allow physicians to recommend marijuana to patients to treat conditions like HIV, Alzheimer’s disease, cancer, Crohn’s disease, epilepsy, multiple sclerosis, post-traumatic stress disorder, autism, rare diseases and chronic pain. The initiative has polled well, with three of four registered voters in support, according to the latest poll by The Salt Lake Tribune and Hinckley Institute of Politics. But opponents have only recently begun to campaign. Initiative sponsors have two more weeks to collect enough valid signatures to qualify for the ballot.